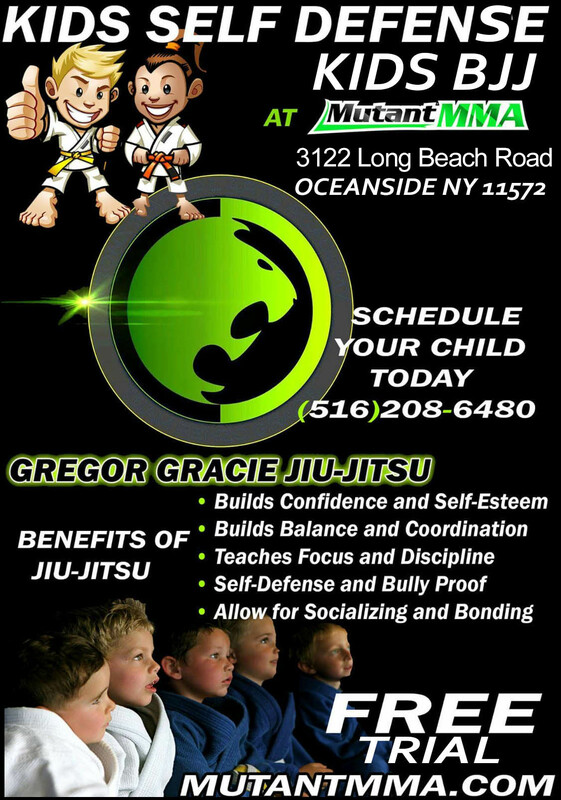 WE NOW OFFER KID'S BRAZILIAN JIU JITSU CLASSES! FITNESS IS ANOTHER SPECIALTY OF OURS! At Mutant MMA and Fitness + Gregor Gracie Brazilian Jiu Jitsu Academy, you can reap the benefits of a boxing, kickboxing, Muay Thai, Brazilian Jiu Jitsu (BJJ), with an MMA exercise curriculum that doesn’t require taking hard hits. All while achieving a complete fitness workout and weight loss program like no other, for men, woman and children alike. Mutant MMA & Fitness of Oceanside in Long Island, NY has exciting, full body MMA workouts tailored for you whether you’re a novice or a professional. When you join Mutant MMA & Fitness for a group boxing, kickboxing, BJJ or MMA class, YOU are the only thing standing in your way. Enable your body to achieve healthy living at a healthy weight and cardiovascular level with our workouts. It’s never too early to start toward getting a toned summer body or maintain the one you already have. Everyone wants to feel secure with their bikini and beach body. So whether you’re a fitness model or competitor, a fighter, or just trying to get and stay in shape, start today! Our unique high-energy, high-intensity exercise classes are designed to help you burn up to 1,000 calories in just one hour. Our professional trainers combine warm up exercises, boxing, cardio kickboxing & MMA techniques, cardio workouts, and toning exercises to help you strengthen your core, build muscle, gain endurance & confidence. The trainers achieve this utilizing six key components which make our workouts unique to any other fitness curriculum. Although all of our Kickboxing and Fitness classes include all of the essential ingredients mentioned above, however, following the schedule throughout the week, we offer focus oriented fitness classes which include, Circuit Training, Explosive Speed and Agility, Boot Camp, and Core classes and Boxing Circuits. These classes are designed to nurture optimal fitness, aerobic, high energy and technique development, producing a more well-rounded physique with a more competent grasp of hand of eye coordination. Which you can see showcased in all high level athletes, as in the UFC. Conveniently located in Oceanside in Nassau County, New York, our state-of-the-art facility has specialty, high end fitness equipment to maximize your results and give you an array of exercises so your workout is always new and exciting. We provide you with everything you need to reach your fitness goals. With your persistence, our team can help you reach your full potential. Be sure to check out our website for pictures and videos of our members and our facility! Check us out on FaceBook, Instagram, Google, Youtube and follow us on twitter for all of our updates, news and visual content! Mutant MMA is an Omni-fitness Martial Arts facility. Here at Mutant, you will find only the best trainers who are at the highest levels of their discipline. From UFC, to world record holders in weight lifting and family lineage that stems from the creator of Physical Fitness, Dan Lurie “The Father of Body Building”. Mutant is also the home to the family that started it all. With two time world champion Gregor Gracie, of the Gracie family who proved that Jiu Jitsu is the single most dominant discipline in all of martial arts. Gregor is the son of Rolles Gracie who was considered the future of Gracie Jiu Jitsu. If you’re looking to get in shape, build confidence, learn self-defense or take your sport to the next level, Mutant MMA has something for you. Whether you or your child would benefit from anti-bullying, confidence building, self-esteem or discipline, Mutant MMA and Fitness is the place that truly delivers. Start your journey to the destination of healthy eating, a healthy lifestyle and keep your body calorie burning all year long! Tap in to your full potential and change your life for the better today! The gym is clean; facilities are located conveniently. You will like the open space here. What made this place special is the ability to relate to it with ease, both, in terms of members and the team of instructors on the floor. The classes are great – I am getting out of workout much more than I expected. Absolutely a wonderful atmosphere to learn Muay Thai, and may other boxing related techniques. Trainers, including staff are very helpful. If you're serious about learning and adapting your boxing traits, give them a try and learn how you fit within their facility. With out a doubt in my mind you will love it just like I did. If you're not getting the results you want at regular gyms, or if you want to try something diffeerent, come here. Tons of space, great facility, awesome trainers. The classes will get you in best shape of your life, and you can learn valuable self defence and fighting skills in the process. An awesome workout.